E S S A Y Loneliness. It’s a killer. Really. An AARP research study found that 17% of adults age 65 and older are isolated. They are facing a 26% increased risk of death due to these subjective feelings of loneliness. Of those over age 75, 51% are living alone. It’s a very safe bet that you and I know someone in this category. Chronic loneliness is already posing a disturbing mental health threat and it’s growing. We live in a society where offspring leave the nest and relocate in far-off places with little connection to their parents beyond telephone calls, texts and emails. Many aging boomers are hanging on to larger homes rather than downsizing to more collective living options such as assisted living facilities or even apartment complexes where they would have more social contact. Downsizing may be a loss of square footage but that’s outweighed by the expanded social contact that can be gained. Exploring options to participate in fitness programs or continuing education courses is another avenue that lonely boomers are going to need to consider if they are really motivated to reduce their isolation. Libraries and religious facilities are also logical places to seek out social connection. The most obvious solution is for boomers to actively support each other. If you know someone living alone, you can be a link to the outside world for them. You’re helping them feel less lonely and you’re helping yourself. The baby boomer generation can act as a giant buddy system which would go a long way to combatting this potential mental health crisis. You might be thinking that this loneliness problem is something far off in your life. Ask someone who has lost a spouse about the one thing that has changed most about their life and you will see that loneliness tops the possible answers you will get. Yes, this should be the time to do great things with our lives but it does not take much to throw those plans out the window. Illness, death or disability can change your social dynamic irrevocably overnight. Final words of advice to baby boomers. Unite! Be there for each other. It’s that simple and it will prove that boomers are not as self-centered as some think we are. So there’s that. 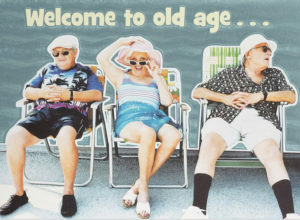 E S S A Y Now that I’m 68, the so-called humorous birthday cards about aging are getting on my nerves. Occasionally, one that is funny does come my way — for instance a Maxine cartoon saying “Reach for the Stars! It keeps your chest from sagging” — but usually the cards’ messages are predictable or insulting. Some attempt to make jokes about conditions they think are typical of aging: baldness; flatulence; impotence; dentures; knee replacements; incontinence; sagging skin; declining memory; constipation; menopause and even dementia — the list of horrors is endless and the jokes fall flat. Perhaps the cards could comment on interesting things that have come to pass in our lifetimes such as “Aren’t you lucky to have made it to the e-age and many good years of net surfing to you!” Or “Isn’t it great that you lived to see the plug-in car and micro-breweries!” “How fantastic that you lived long enough to have your face on Facebook!” And if you can’t find a decent card, buy a blank one and write your own message. So what I’ve learned from my card searches is: Come on, Hallmark, get going; hire us Baby Boomers to write for you and we’ll revolutionize that pathetic senior card market! Judith Amber is a free-lance writer living on California’s Central Coast. She writes on topics including food and wine, the environment, politics, travel, and the arts. She also writes creative non-fiction, humor pieces and poetry. E S S A Y I’m not exactly sure when I knew I was meant to be a writer. It must have been when I was very young. It could have been when I realized words were important because whenever I asked my mother how to spell a word she made me look it up in the dictionary. So words are collected and put in books. Maybe that was the start. By the time I was in high school, I was typing up short stories that I was sure the New Yorker magazine would be delighted to publish. In college I was bored with the standard curriculum but enthralled to be taking creative writing classes. My mentoring professor told me I had writing talent and I believed her. Once established in my public relations career, I was writing speeches, congressional testimony, news releases, and articles for publications. I was getting paid to write – I was a professional. I had enjoyed mystery novels for quite some time but it finally occurred to me that perhaps I could write one. I was living in Annapolis when I got serious about the possibility. The mystery subgenre that interested me most was the accidental detective. A crime is committed and with no experience for detecting, the main character attempts to solve the mystery. It’s even more interesting if it imparts some knowledge about people and places that are outside your own experience. Annapolis and the boating scene on the Chesapeake Bay offered just such an opportunity. And that’s how my mystery novel entitled Head Above Water came to be. I wrote the kind of mystery novel that I liked to read. That was a long time ago. For years I would not let anyone read it. But then one friend was allowed to see it, and then another, and another and another. All were enthusiastic and encouraging. 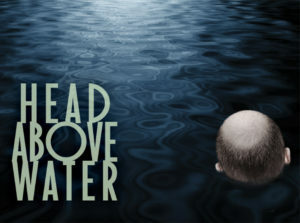 By then self-publishing had emerged as a real avenue for aspiring writers, so after 13 years, Head Above Water is finally available on Amazon and Kindle. I’m no longer a pre-published author as it used to read in my byline. I should savor the moment but it has freed me up to work on the new mystery featuring an aerial photography pilot in New Mexico. No time to waste because I am not waiting 13 years for this next one to get published. E S S A Y Don’t sweat the small things. That’s what the gurus say. But sometimes small things – like the carpet-eating moths that have bunked up in my Santa Fe house – cause oceans of sweat. After moving away from the too expensive and stressful Bay Area; buying, and remodeling this delightful house; meticulously arranging my precious wool rugs from Oaxaca, Turkey, and Iran; and neatly stacking my consignment shop sweaters, I relaxed – until I saw them. Tiny wheat-colored moths strolling across my favorite wall hangings. I researched: They have bacchanals on wool and silk. One female can lay 150 eggs, which hatch into larvae, which gorge themselves, chewing fist-sized holes in beautiful textiles. Then they pupate, starting their revels over again. This week I’ve been vacuuming like a woman possessed, inspecting sweaters, scarves, gloves, and socks; taking clothes to the drycleaners, freezing rugs, baking others in the sun, placing sticky traps laced with pheromones to lure the males; and ordering pyrethrin sprays from Amazon to repel the little bastards. I called a rug company in Ithaca, NY, four times – they have moth experts. A fifth time I called just for moral support: What if just one female or one wriggling larva survives all my assaults? Before breakfast this morning, I was on my knees. Not praying, but looking under my sofa — because that’s where the experts say they lurk. I was thinking: how ridiculous is this? Then I thought of my father. After being blacklisted by Joseph McCarthy and losing his job, he started a pest control business. It was hard work, crawling around bakeries and other commercial establishments looking for cockroaches and rodent droppings. 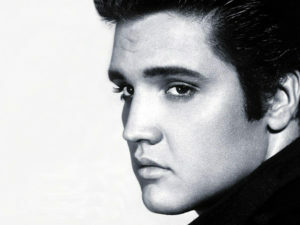 He was a smart man, and had loved his white-collar job at the Food and Drug Administration. He became an angry man. To his dying day, he said he felt like a man without a country. And though he didn’t say it, I knew he felt demeaned by the dirty work, down on his knees. 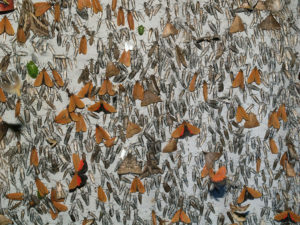 I had an epiphany on the living room floor: maybe my moth obsession had something to do with feeling my father’s pain. I remembered him coming home from work, face lined, green coveralls dirt- and poison-soiled. As a little girl, I thought if I was really good, I could make him be happy. I didn’t have that power. And today, no matter how conscientious, I may still miss one damn moth, and there’s not a thing I can do about that. We humans imagine we can control things – from tiny moths to aging and illness — only to find that we control almost nothing. I’m alive and healthy. I have great friends. I have poetry. And the New Mexico sky is astonishingly beautiful. So I’ll remember what the gurus say. I’ll do my best, and stop sweating the rest. We have had enough. Please help us. Our records indicate that you have purchased and presumably consumed fast foods during the past several years. For this we thank you from the bottom of our hearts. Our colleagues are under constant attack from effete politicians, megabuck corporate welfare daddies and vapid commentators from sea to shining sea. What is the first thing people say when they want to beat somebody up about education, crime, welfare? 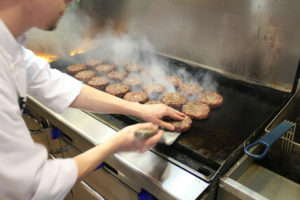 “Flipping burgers. If we don’t put a billion into satellite links to kindergartens, these kids will wind up flipping burgers. If we don’t put pool halls in the prisons, these guys will return to crime – they don’t want to be flipping burgers. If we don’t elect Bob Heartworm, all the people in the district face a future of flipping burgers.” This in a country that can’t wait for weekends so that people can fire up the grill and flip their own burgers. Go figure. Disrespecting fry cooks is hypocritical, immoral and un-American. What in the world is wrong with commercial food preparation as a job? Not everybody gets to be the president of a multi-national corporation right out of grade school. We’re a hungry nation on the run. Fry cooks feed millions every day. What’s wrong with that? It’s honest work. It’s necessary work. They don’t have to sign life contracts. All they have to do is show up. And they do. By the tens of thousands every day. It’s enough to make you want to run outside and scream. Go ahead if you want to. This letter can wait. There. Well, that’s the story. We need your help. The next time you hear or read of someone denigrating this honorable calling, take issue. Or drop us a line. We’ll take issue for you. Lanny Tonning is a pilot, roustabout, mechanic, bottle washer and co-owner of Old Town Farm and Bike In Coffee. When he’s not doing all those things he’s 4-wheel driving on roads that are not really roads.